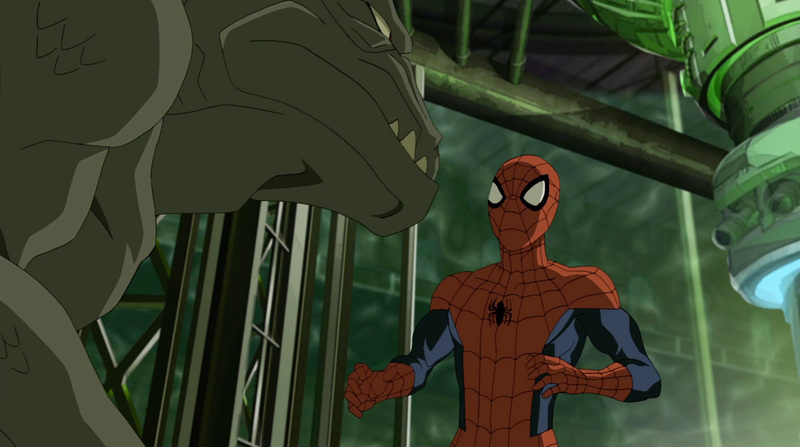 The Ultimate Spider-Man is one of our family’s favorite shows and, thankfully, the new season is right around the corner. This season promises to be packed full of new adventures and villains, and special appearances by members of the Avengers. Also beginning this Monday is the “Marvel Comics Close-Up” initiative. a new program to champion children’s literacy through Marvel comic book storytelling. 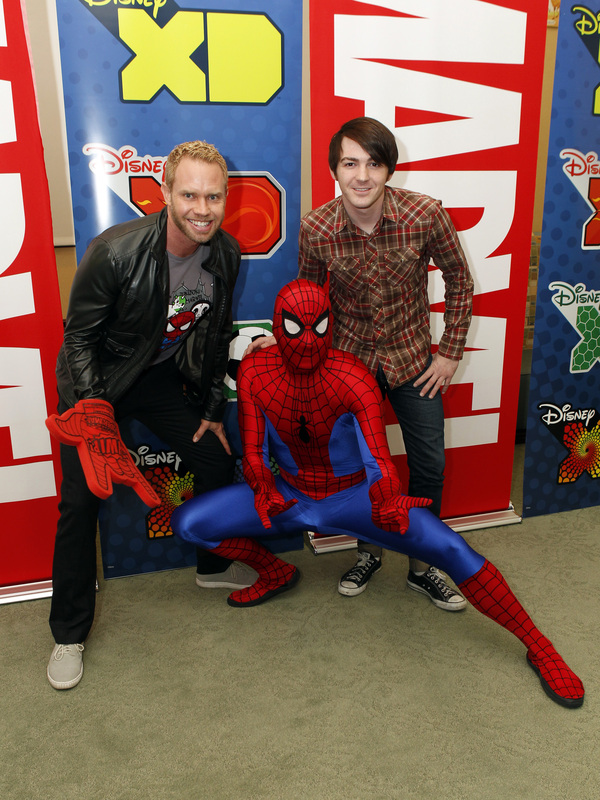 I was given an exclusive interview with Cort Lane, Supervising Producer of the Ultimate Spider-Man series, to get his insight into this season as well as get his thoughts on children’s literacy and the new program, which is backed by Disney XD, Marvel Entertainment and First Book. Cort Lane: I think there is an emotional arc that is even greater and more challenging for him in the second season. He’s training to be a better hero in the first season. In the second season, he’s learned a lot, but now he is taking on new responsibilities. Nick Fury challenged him to take on a lot of responsibility and become a better hero in season one, and in season two Peter takes on new responsibility on his own. He takes on responsibility for his team mates and he’s also taking on the responsibility to be their leader, it’s not an easy fit for him. Being a leader doesn’t come naturally because he’s a loner. He’s also a teenager, so he makes mistakes. That’s a big emotional burden on him. He’s also taking responsibility to help two friends that are very connected to Spider-Man. He wants to help Harry and save Norman Osborn from being the Green Goblin and he works towards that in the new season. His buddy and mentor from S.H.I.E.L.D, Curt Connors, becomes the Lizard in the first episode of the season and Peter has this intense need to do what he can to not only help stop the Lizard but cure him and get Curt Connors back to the friend that he needs. GM: After the destruction of the helicarrier in the last season, I’m guessing the rest of the team might feel a little displaced. Will we get to see them adjusting to living with Peter and some of the challenges they face living dual identities with Aunt May? CL: Yea and we get to learn the origins of each of his team mates, in special stories that run throughout the season. This is still the Spider-Man show, so it’s still focused on him, but he is going to learn a lot about his team mates and through that we get to see how they got their powers, where their families are and it links to all aspects of the Marvel universe. CL: You know, it’s a dynamic that was a bit antagonistic and frustrating for everyone in season one, and there is still some of that in season two, but they are really jelling as a team right now and now it’s more about being effective in the way that they fight, training exercises and being connected. On top of that they are going to look to Spidey to be a leader and he’s struggles on that path a bit. So his arch (Spider-Man) this season is very much about him becoming a leader to these other kids and knowing how and when to call them in and how to guide them. The only one I can give away right now, because it’s early in the season, is in episode five Hawkeye shows up and the two of them have a sort of unlikely and surprise team up and neither one of them is really up for it. They don’t necessarily get along but a very different tone than Spidey and Wolverine and it’s a great story. We will be seeing the Sinister Six, Lizard, Electro, Rhino, Beetle, Kraven and a secret sixth member, and the first six episodes will lead up to the formation of the Sinister Six and the team will finally be formed in episode six. 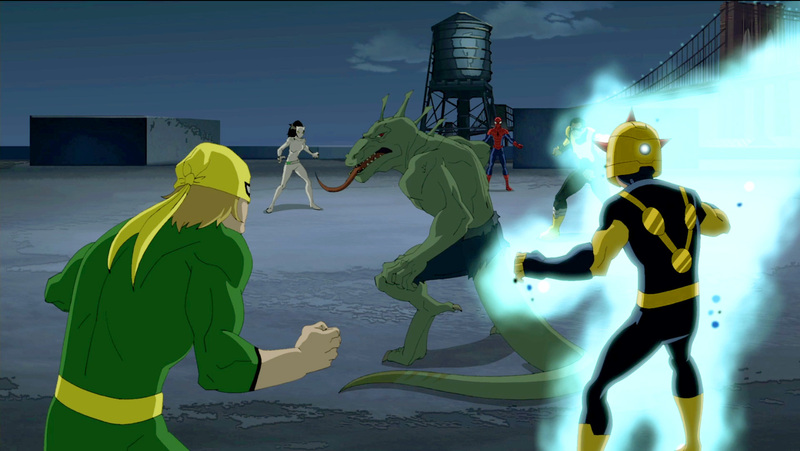 The sinister Six will also come back at the end of the season. There are some classic Spider-Man villains that you will get to see as well. CL: I think that we knew a fair amount about that movie and we knew that the Lizard was going to be the villain, and we knew we wanted to feature the Lizard as well, following his exposure in the movie. So, in season one, we set out to introduce him as a character and see that Spidey and him are simpatico and they have so much in common since because they are both tech nerds and they become friends. This way, it would be much more emotionally impactful at the beginning of season two Curt turns into the Lizard, because that’s his friend that has turned into a monster. So, we are able to link to those elements of the movie and of course Spider-Man’s a teenager in high school and all of that is very related and we are able to connect to those elements in the show. GM: What is the “Reading With: Marvel Comics Close-Up” initiative and how is the Ultimate Spider-Man going to contribute to it? It consists of two main pieces, first are these interstitials, that first features Jose Quesada and Disney XD actor Dylan Riley (Disney XD “Kickin’ It”) and they’re a minute long and they deal with a specific issue from a Marvel comic (either modern or classic) and Joe talks about why that particular issue is very cool because of the origin of a character, the reveal of a character or something significant that happens in the life of the character. They talk to the kids about the stories and then kids get to stream the comic book for free through Disney XD website. It’s pretty neat on a lot of levels. First it invites kids into that experience. I myself learned to love reading through Marvel comics and as a kid, I wasn’t much into anything until I read an Avengers comic and from that point on I became really engaged in reading. I become really imaginative and really focused on the stories and characters and wanting to tell stories and interest in designing costumes. There are lot of those choices made and of course we feature characters like Thor, Captain American and Ironman and even those have a link to the show Ultimate Spider-Man , like we have a great Invincible Iron Man story that’s a team up with Spidey and has the same sort of interaction that they have in the series. There’s a classic Thor story where Loki turns Thor into a frog that we featured that in season one of the series. So, we made sure that we selected comic books so that kids that are fans of the show will find things in these comic books and there interstitials that will interest them further. CL: Yea, exactly and we have a bit of that in every season where we are inspired by specific stories and we know that adult fans will recognize that and kids won’t and that’s cool and one person might say, “hey this is the comic book version” and we respect that. CL: You know I think, Spider-Man is, and he is for reasons that are not really surprising. He’s a kid himself in the context of this series and in the Ultimate Spider-Man comics and when he was first introduced, so that’s very related about right there. He also has a lot of challenges. He’s a loser in real life and he has a tough time. He makes mistakes and all of that is so relatable and makes him very likeable. On top of that he’s funny and cracks jokes and finds the humor in his challenges and that makes him very likeable because everyone likes someone who’s funny. CL: My fist comic book was Avengers #161 – Attacked By The Ant Man , was the exact issue and it had a huge impact on me personally and I remember it vividly. I actually just read it again the other day because of this whole literacy program and Marvel Comics Close up came up. I remember I didn’t understand many of the works, they were big words, words like (subliminal or intangible), so I had to go to the dictionary, but I also remember the characters were just so cool and the relationship between the characters were really complicated and it ended with this cliff hanger and I had no idea where it was going to go and it was and exciting adventure and I became a crazy Avenger fan and have been my whole life. So for me the stories and thinking of my own storylines and redesigning costumes became sort of my childhood and that’s what I did in my spare time and it has served me well because now I get to make shows about those characters.